An unexpected lunch at T.G.I. Fridays turned out to be a great day for burgers. Real burgers. I've always enjoyed the burgers at T.G.I. Fridays, not only does it taste great, it also evokes the cool imagery of classic Americana, pop culture you can taste. Gerry's Grill expands it branch network with a third branch in Singapore. After just nine months from the opening of its second branch in Singapore, Gerry's Grill successfully opens its third outlet in Makasuntra Glutton's Bay at the Esplanade Waterfront, a popular food destination among locals and tourists. Makasuntra brings together the best and most popular food vendors around Asia at very affordable prices. "Aside from expansion, the opening of more branches in Singapore aims to promote Filipino cuisine in locales where many tourists go. It's about time we go mainstream," says Gerry Apolinario, chief executive officer (CEO) and president of Prime Pacific Grill, Inc. (PPGI), operator of Gerry's Grill. 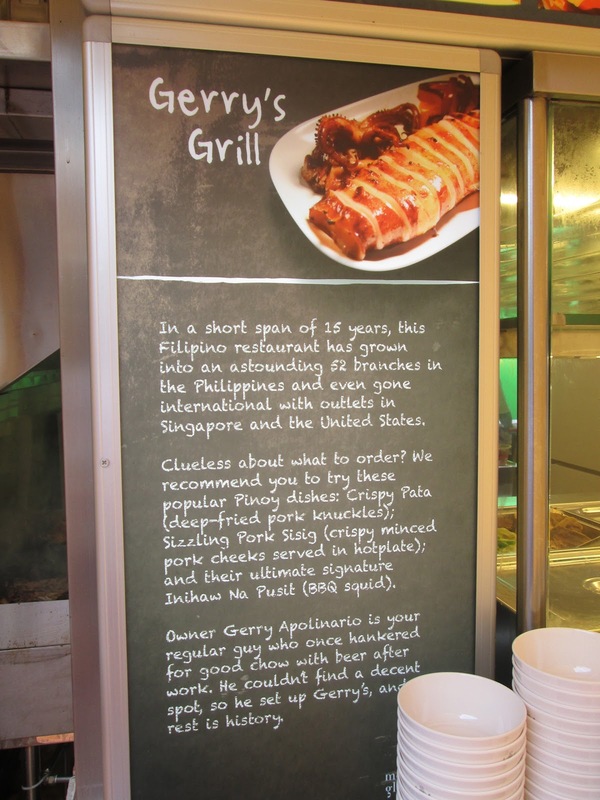 Like its local counterparts, Gerry's Grill branches in Singapore offer Filipino bestsellers like Kare-Kare, Grilled Pusit, Crispy Pata, and Bulalo, among others. There's a new joint specializing in subs, or hoagies, offering fresh sandwiches with excellent value. Not your typical 6-incher, but a larger 8-incher with more filling, more options to choose from at reasonable prices. Very cool. Hoagies, a Philadelphian term for the classic sub, hero, or Italian sandwich is said to have its origins from "Hog Island," where predominantly Italian and Irish settlers were called "Hog Islanders." Hog islanders were particularly fond of large loves of bread stuffed with meat, called "hoggies," and in time evolved to "Hoagies." Cool. Now you know. It was my Color Coding Day, and I was at Watami early. Really early. But it seemed like a good idea to spend the day by the bay. And it was. Recently opened only this November, Watami brings its extensive line of signature dishes and drinks to the Mall of Asia. An established and well known chain in Japan with a string of regional successes in Malaysia, Hong Kong, China and Singapore, Manila finally gets a taste of Watami's cool take on contemporary Japanese cuisine. I was invited along with other bloggers to sample Watami's signature dishes, and no color coding traffic scheme could hold me back. Nope, not on this fine day by the bay. Just purchase one Large Big Bonanza (14") and four regular Coca-Cola for only P 610 and you get a Nestle Drumstick Loaded Ice Cream (800 ml) for FREE. Yup, free ice cream with Papa John's Big Bonanza Christmas Trio. It's rare to find a restaurant serving Indian, Italian, Singaporean and Filipino food, all in one place. Rarer still to find such a place along Visayas Avenue in Quezon City. Oliva Bistro Cafe is one such place. The reason behind Oliva Bistro Cafe's diverse menu is Chef Kannan, who comes from India, trained in classic Italian cuisine, worked in Singapore, and married to a Filipina. This diversity brings the best of each cuisine in the different dishes served by Chef Kannan and wife Denden, with each dish remaining true to its origins, no fusion dishes here. Conventional wisdom often dictates the need to be single-minded and focused in an increasingly competitive culinary landscape, but here at Oliva Bistro Cafe, one is encouraged to experience the journey of the husband and wife team as they serve you the different dishes they love from different culinary cultures. Cova, which means "cave" in Catalan, is a refreshing new take on the usual tapas bar. An extensive wine selection, excellent Spanish food, great service and impressive interiors combine for an awesome experience at Cova. Great place to enjoy good food and drinks to while away the traffic...and stay a while longer after the traffic's gone. It's always great to know that one can find true authentic flavors, and when you're craving for that distinct taste of Singaporean hawker cuisine, you don't need to go far. Named after a district in north central Singapore famed for its food markets and local cuisine, Ang Mo Kio's menu is inspired by the district's hawker food stalls, using only the freshest ingredients and cooked from scratch for that distinct and authentic taste of Singaporean hawker cuisine. The place. The food. The perfect spot for a true Japanese feast. Diamond Hotel's Yurakuen, an award-winning restaurant offering the very best in Japanese cuisine, is one of those rare places where you can see, feel and taste real authenticity at every turn and in every dish. Yurakuen, which means "paradise" in Japanese, is an appropriate name. Every dish is expertly prepared and supervised by Japanese master chef Junichi Sekiyama, from traditional sushi and sashimi, to the freshest and most elaborate seafood and meat dishes matched with aesthetics that feed the eye as well. All this against a backdrop of impressive three-story high floor to ceiling windows surrounding a magnificent all-glass cherry blossom tree as the centerpiece. And one can understand why the name Yurakuen was chosen. It's been a while since I last enjoyed Yellow Cab's Dear Darla, way too long. It was definitely time to catch up on a dear old friend. The unique rolled pizza includes fresh arugula and alfalfa sprouts, very cool. Not only is it refreshingly different, it's actually fun rolling your own little Dear Darla. Some say the best of traditional Filipino cuisine can be found in old family recipes, passed and lovingly preserved through generations. It is here where one can taste the richness and regional diversity of traditional flavors, and through time, enhanced by culinary influences and a shared history resulting in a fusion of Spanish and Chinese flavors that remain so comforting. Myke Sarthou, or Tatung as close friends fondly call him, grew up with these old family recipes, and shares them in his new restaurant, Chef Tatung's at the Acacia Estates. Mike Sarthou began his culinary adventures sharing his favorite family recipes with close friends, and in no time, quickly gained a following. Converting part of his home into Tatung's Garden Cafe, and by word of mouth, eventually became a favorite spot among foodies searching for familiar, traditional flavors with a refreshing and contemporary twist. With everything going so well, it couldn't get any better. But it did. An opportunity to open a much larger restaurant in a new location led Chef Tatung to Acacia Estates in Taguig City. And just last Ocotber 26, Chef Tatung's formally opened in its new location.